Colin Farrell and Rachel Weisz bond on the run. My favorite film so far this year, "The Lobster" is a tongue-in-cheek modern-day fantasy that's so deliciously strange and stylish it's like what you might get if Lars von Trier directed a Charlie Kaufman screenplay. 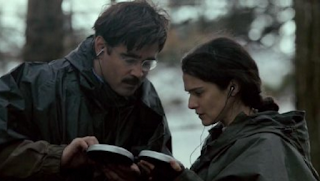 Colin Farrell gives a coolly deadpan performance as man who will be transformed into the animal of his choice (a lobster, in his case) if he doesn't find someone to hook up with at a hotel full of similarly desperate singles. That's all you need to know. Really. Just go.